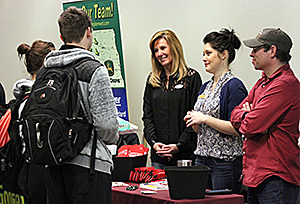 The Minot State University Career Center will sponsor the 2017 MSU Career Fair Wednesday (March 29) in the Conference Center from 10 a.m. to 2 p.m. MSU has held a career or job fair for 29 years. Employers with full-time, part-time and summer employment opportunities, as well as internships, will answer students’ questions, accept resumes and possibly conduct or set up interviews. Students should bring their resumes, dress professionally and use this time to explore careers, network and apply for positions. The career fair is open to all Minot State students in all majors. See the list of employers attending online. For more information, contact Bertsch at 858-3362 or Lynda.bertsch@minotstateu.edu. Minot State University's chapter of the National Students Speech Language Hearing Association is holding its 2017 spring conference Friday (March 31) in the Conference Center from 8 a.m. to 4:30 p.m. This year, the theme is “School-age Stuttering Therapy: What do we ALL need?” The morning’s sessions are: “Needs Assessment for Stakeholders/Framework of Therapy” and “Skills: Setting up for Success Education.” The afternoon’s topics are “Getting Started Cognitive/Affective components of Therapy Speech Management Technique: How to Start” and “Integrated Speech Management Techniques.” The conference focuses on creating successful outcomes for school-age children who stutter. The keynote speaker, pictured at right, is Nina Reeves, a speech-language pathologist, who is a staff fluency specialist for Frisco Independent School District, Dallas, and a fluency specialist consultant for San Diego ISD. She specializes in facilitating private practice stuttering therapy services to children and adolescents who stutter. A published author, Reeves is a nationally recognized presenter is the area of fluency disorders, and she serves on state and national level committees. This conference is intended for speech-language pathologists, educators, university faculty and students as well as other interested people. On-site registration is $100. All communication disorders majors and graduate students must attend the conference with pre-approval from all professors. The conference is free to all MSU students, faculty and staff. The event brochure and registration form are online. For questions, contact Lessmeister and her co-chairs, Christina Beck and Johanna Nolin at misunsslhaconference@gmail.com. Lindsey Eliasen, the MSU Senior Concerto Competition winner, will solo with the symphony. The Williston native, pictured at right, studies under James Fusik, music assistant professor. Minot State University students, faculty and staff are admitted free with a current ID. Ticket prices for adults are $25 main floor and $30 balcony; senior citizen is $20 main floor and $25 balcony; students 13-17, $15; children 12 and under, $10. Erik Anderson, principal cellist, invites attendees to a 6:30 p.m. preconcert lecture for an inside look at the symphony program. For more information, visit the MSO website. Please join MSU Life for a comedy show featuring Drew Lynch Tuesday (April 4) in Ann Nicole Nelson Hall at 7 p.m. This event is free and open to the public. For Lynch, according to his website, becoming a comedian was almost as unintentional as capturing America’s hearts. An Indianapolis native, at the age of 19, he moved to Los Angeles with lifetime aspirations of becoming an actor. An unexpected softball accident just a year into his acting career left him with a severe stutter and crushed his hopes of ever performing again. His vulnerability in dealing with his stutter and making it relatable to real-life situations propelled him each week of the America’s Got Talent competition — advancing him to the finals and ultimately landing him as first runner-up on season 10. For questions, contact Aaron Hughes, student activities coordinator, at aaron.hughes@minotstateu.edu. “Who’s Who Among Students in American Universities and Colleges” selected 17 Minot State University juniors and seniors for inclusion in the 2017 edition. A campus nomination committee and editors of the annual directory picked the students based on their academic achievement, service to the community, leadership in extracurricular activities and potential for continued success. They will be honored at a luncheon April 5 in the Conference Center at noon. The directory has been published since 1934 and was inaugurated at what was then Minot State Teachers College in 1937. Six students, three males and three females, were selected the first year and that was the standard for many years. The honorees, listed by hometown, class rank and major, are: Katie Abrahamson, Minot, senior, graphic design and photography; Emilee Baggett, Minot, senior, elementary education and early childhood education; Maleyna Beale, Wichita, Kan., senior, biology; Jordan Busch, Minot, senior, accounting and finance; Kristen De Delley, Brandon, Manitoba, junior, communication disorders; Inga Dudley, Red Wing, Minn., senior, mathematics education; Margaret Flinn, Corvallis, Ore., junior, criminal justice; Chelsea Geis, Qu’Appelle, Saskatchewan, senior, special education; Kendall Green, Winnipeg, Manitoba, junior, communication disorders; Breanne Hatfield, Manteca, Calif., senior, chemistry, biology and mathematics; Morgan Hunter, Invercargill, New Zealand, senior, psychology; McKenzie Kranz, Minot, senior, elementary education and special education; Erika Mohica, La Union, Philippines, senior, biology; Kevin Morgan, Tema, Ghana, junior, international business and marketing; Jayden Moum, Minot, senior, accounting and finance; Else-Marie Nelson, Minot, senior, physical education; and Noelle Padilla, Houston, Texas, senior, nursing. To make a reservation for the luncheon, contact the Office of the Vice President for Student Affairs by March 31 at 858-3299 or 1-800-777-0750, ext. 3299. The Minot State Program of Theatre Arts will present “The Shape of Things” by Neil LaBute. The show will be performed April 5-8 in the Black Box Theater in Hartnett Hall at 7:30 p.m. The play is set on a college campus in a small Midwest town and follows the lives of four young people who find themselves delving into the world of art and what it all means. Weinert-Lishner decided to take a conceptual approach to the play’s design by incorporating the theme of construction into the actors’ performances. “The main characters are trying to construct themselves and move the other characters to construct themselves in different ways,” said Weinert-Lishner. The cast includes Michaela Burns, Samantha Christman, Hannah Davis and Dan Fagan. The stage manager is Erin Bliss. Admission is $10 for adults, $5 for seniors, military, and youth 18 and under. MSU students, faculty and staff are admitted free with current MSU ID. Reservations can be made by calling the box office at 858-3172. This production is for mature audiences only. Let the kids enjoy a coloring activity while learning about the brain. They can also have their faces painted. Adults can have their blood pressure checked and learn about health issues such as concussions and diabetes. Minot State University is returning to Dakota Square after a three-year hiatus. The Minot area community is invited to attend MSU at the Mall April 8 in the JC Penney Court, from noon to 3 p.m. This interactive venue provides a great opportunity for Minot State to feature its academic programs, services and student organizations. With campus groups participating, MSU at the Mall will be an afternoon full of activities for all ages to learn more about the university. Featured events include demonstrations, face painting, and blood-pressure, fasting blood sugar and cholesterol screenings, to name a few. The athletic training students will conduct testing for concussions and provide information on concussions, ankle sprains and heat illness. For more information, contact Loftesnes at 858-3062 or teresa.loftesnes@minotstateu.edu. Ash Bowen, English assistant professor, will discuss “Lie and Fact in Geoffrey Brock's ‘And Day Brought Back My Night’” April 12 for The Two-Minute Lecture Series. He will be in the Beaver Creek Café by the curved wall at 12:30 p.m. Come on out and time it. On April 26, Rick Watson, communication arts and humanities instructor, will present “Cafeteria Blues.’” For questions, contact Robert Kibler, co-chair and professor within the Division of Humanities, at Robert.Kibler@minotstateu.edu. This morning (March 29), the MSU Concert Choir, under the direction of Carlos Vieira, music assistant professor, was part of a choral concert during the North Dakota University System Legislative Showcase. The Legislative Showcase, a special higher education day at the North Dakota Capitol, is coordinated by the NDUS Public Affairs Council. The choirs of Valley City State University and University of North Dakota joined Minot State University for the concert program. The MSU Concert Choir also performed for Bismarck’s Legacy High School and Mandan High School. For questions, contact Vieira at carlos.vieira@minotstateu.edu. The Minot Area Chamber of Commerce Governmental Affairs Committee hosts Saturday legislative forums at the North Dakota State Fair Center, with the next forum Saturday (April 1) at the NDSF Center from 9 to 11 a.m. The forums give attendees a chance to meet with Minot area legislators and ask questions. The format includes a moderator who asks questions submitted in writing by the audience. March 29-30 — Print and drawing exhibit by Iowa artist John Kaericher, Library Gallery. March 29-30 — “Spectacles, Top Hats and Ties: David Driesbach Prints,’ by Chicago printmaker, Hartnett Gallery and Flat Tail Gallery. April 6-May 4 — MSU Juried Student Art Show, Hartnett Gallery. A public reception for the MSU Juried Student Art Show will be April 6, from 6:30 to 8:30 p.m. in the gallery, with award presentations and juror remarks at 7 p.m.
April 12-May 13 — “Mugs and Monsters,” ceramics and soft sculpture by senior art students Rachel Alfaro and Kalyn Dewitt, Library Gallery. A public reception for “Mugs and Monsters” April 20 in the Library Gallery from 6:30 to 8:30 p.m.
Mary Huston, assistant professor of communication disorders, was recognized Wednesday (March 29) as a faculty member who demonstrates innovative use of technology in the delivery of classroom instruction at the NDUS Legislative Showcase. Sayeed Sajal, assistant professor of mathematics and computer science, co-authored with B. D. Braaten, North Dakota State University professor, “A Conformal Antenna on a Passive UHF RFID tag using 97% Carbon Content Graphene-Based Conductors and Paper Substrates.” It was accepted for presentation at the 2017 IEEE International Symposium on Antennas and Propagation, July 9-14, 2017, San Diego. Sajal also co-authored with R. Shadid and S. Noghanian, University of North Dakota researcher, and professor, “Efficiency Comparison of Inductive and Microwave Power Transfer for Biomedical Applications,” accepted for presentation at the 2017 IEEE International Symposium on Antennas and Propagation, July 9-14, 2017, San Diego.